MommaSaid | We’re Gonna Have Fun, Dammit! Browse: Home / 2015 / April / 07 / We’re Gonna Have Fun, Dammit! Allowing memories to happen in NYC. And so we go about the business of making memories, Instagramming and Facebooking them along the way as proof that we are excellent modern parents. But those memories we’re making aren’t necessarily good ones, no matter how many trips to Party City we make, or which hotel room we snag at Disney. Take my plans to have a “New York Day” one year after the 9/11 attacks. I was determined to show my kids (and my fears) that nearby New York City was a safe and wonderful place to visit, despite the giant hole downtown. So I got four tickets to see the Radio City Christmas Spectacular. When my family at the show, I bought ridiculously overpriced bags of popcorn for my sons, then ages 4 and 5, and we settled into our seats. “When the Rockettes retire,” I sighed, and braced myself for a long day ahead. What made me think that my young boys, whose interests at the time centered around watching cement trucks churning in parking lots, would want to watch anyone dance? Similarly, what made me think they’d want to stand in a 90-minute-long line of tourists waiting to go up the elevators at the Empire State Building? Ten minutes into the line, my four-year-old seemed to lose control of his bones, and wound up spending much of the remaining 80 minutes in a pool of agony on the floor. As the line moved, I slid him forward like a hockey puck. By the time we got to the observation deck, the fun had long run out. We quickly retreated to the parking garage to retrieve our car. At the end of our “New York Day,” the kids were tired and cranky and the adults were tired and cranky. So, what’s our memory from that day? The quote, “When’s the dancin’ part gonna end?” which we say each holiday season when the Radio City Christmas Spectacular TV commercials air. If I had instead planned a simpler day, we could have happier memories of it. At that age, my kids were content to ride into the city, eat a hot dog from a street cart, stare at tall buildings–from the street–and watch the ice skaters at Rockefeller Center. Notice that I didn’t say “ice skate at Rockefeller Center.” Because that would have required standing (or collapsing into a ball) in a long line, fitting two little kids with rented ice skates, keeping them upright and safe from careening teenagers on the ice, and explaining why they should have gone potty before we got in line. I know now that you must understand the event’s participants and respect their tolerance level for the effort required to make memories. Since then, I’ve eased up on the memory-making. I’ve been known to cancel plans to see cool things when the mood in the family is off, such as declaring that we’re spending the afternoon at the hotel pool instead of inside (hot and crowded) Disney World, where I’d heard a parent snap, “We’re gonna have fun, dammit!” Now that my kids are older, I include them in the planning, so they get to do what makes them happy. Or, dare I say it: I send them on their own. My 18-year-old is at the Guggenheim Museum in New York City today with a friend, and I am not. 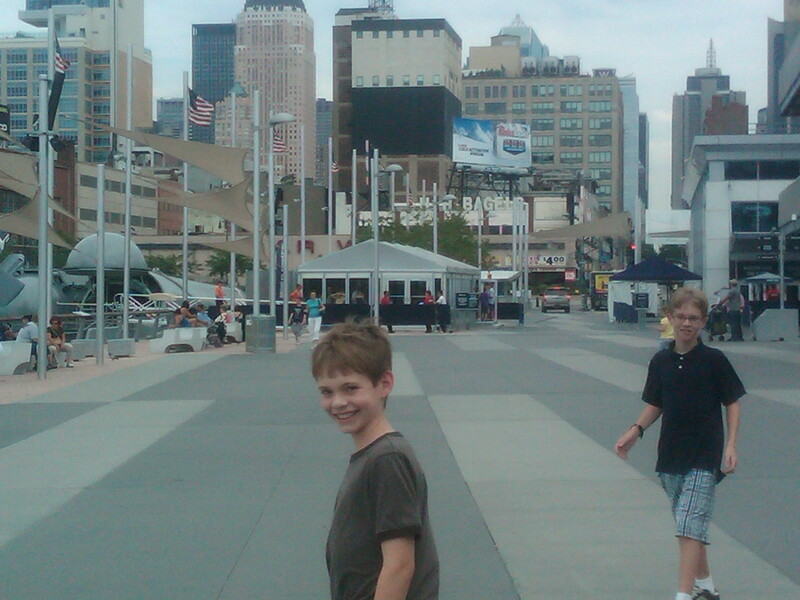 He knows how to make his own “New York Day” memories now, as it should be. 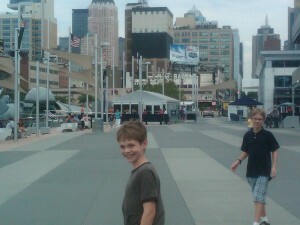 Since our “New York Day” after 9/11, I’ve introduced my sons to the city, as done on our own terms. We haven’t so much made memories as we’ve allowed them to happen. And that makes us happy. Dammit.